Welcome to Las Vegas: the land of lights, attractions, and incredibly hot summers! Cal Air wants the people working, living, and visiting the Greater Las Vegas area to enjoy their summers in comfort. Cal Air became a licensed Carrier dealer so we can offer the best air conditioner systems available to all of our clients—both residential and commercial. 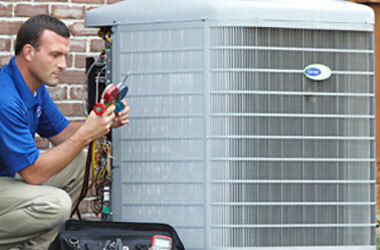 Our expert HVAC technicians can also repair existing air conditioner systems to keep them running their best. Don’t let the baking Nevada heat keep you down. Call Cal Air today, and let us help you stay comfortable. Air conditioning systems are complicated and need proper care and upkeep if they’re going to work their best. Cal Air provides expert maintenance services to keep the cooling systems in homes and commercial properties working efficiently. Commercial properties can have massive cooling needs. Cal Air offers professional help and 35 years of experience to commercial property owners for the installation, repair, and maintenance of commercial air conditioning systems. New residences and commercial buildings need air conditioning systems if they’re going to keep the people inside comfortable. Old air conditioning systems eventually break down and need replaced. Cal Air offers expert replacement of old HVAC systems as well as fresh installations of new hardware. Cal Air is proud to be an authorized Carrier dealer. Carrier HVAC systems are some of the best available in the industry and offer unprecedented quality and efficiency. 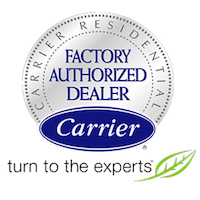 Let our expertise work for you when we install Carrier HVAC technology.